While searching the $1 bin at The Comic Bug I came across a Marvel Super-Heroes comic book I had to have for the tag-line in the upper right corner, "When Balls Collide!" It actually says that on the cover! 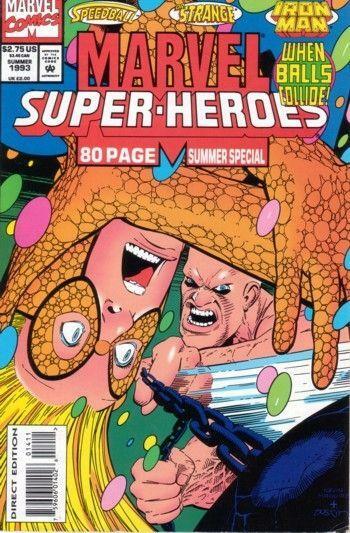 Of the 3 stories that comprise Marvel Super-Heroes #14, the Speedball story is the one that get's the cover's tag-line. The line refers to the energy balls that surround Speedball and the ball connected by chain (ball and chain) to the villain the Absorbing Man. They battle it out in the last story of the issue. Both characters have a "ball" connection, but a better fit for the comic of the day tagged with "When Balls Collide" would be a passionate story between Speedball and Quasar. "Balls" would have a very different meaning in this story that would never get past the comic code back in the day. Oh, and look at the picture of the Absorbing Man on the cover. He looks exactly like Kane from the WWE (formerly the WWF).